This is the first installment of our $5000 commitment to EPIC to assist them with running their youth programs." 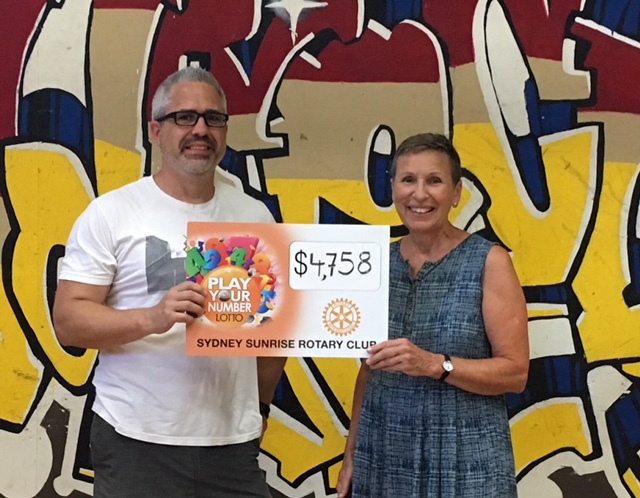 Sydney Sunrise Rotary fundraiser for the Rotary Foundation, thanks you all who got a ticket for this fundraiser, the amount of $1440.00 was donated by Roger Burns in memory of long time member of our club Brian Beckett. 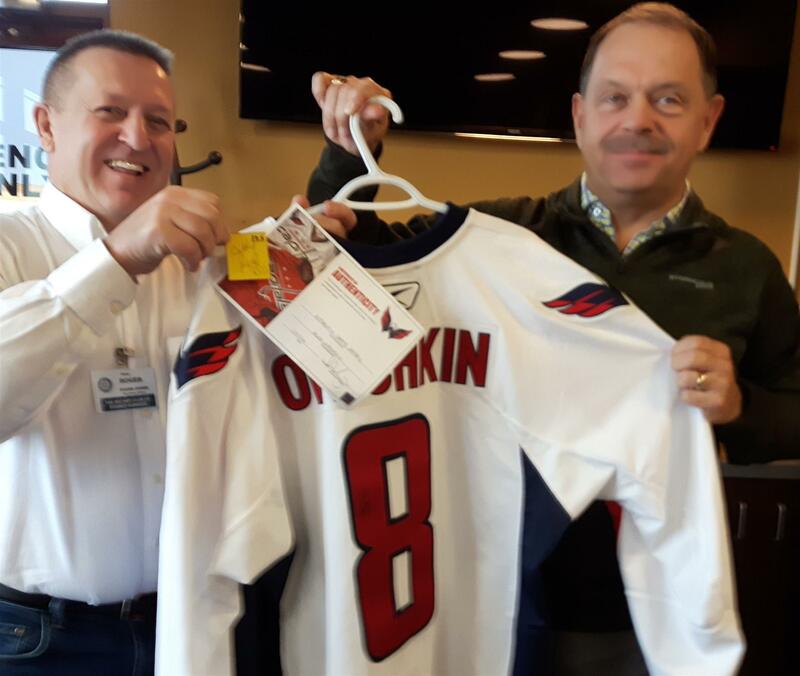 Winner of the Authentic Autographed Alex Ovechkin Jersey is Cathy Rice from Peterborough, Ontario. Cathy is donating the Jersey back to the Club, thank you Cathy ! 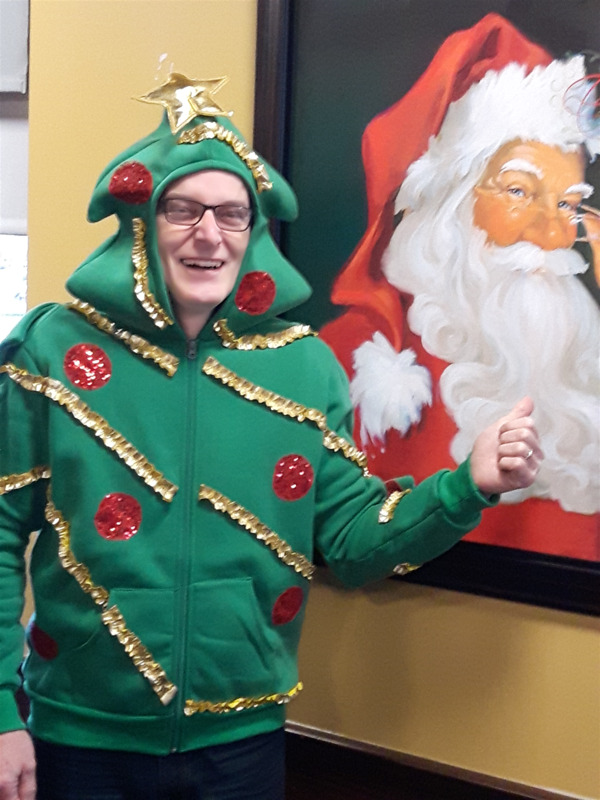 Ugly Sweater Day..It's all good fun! 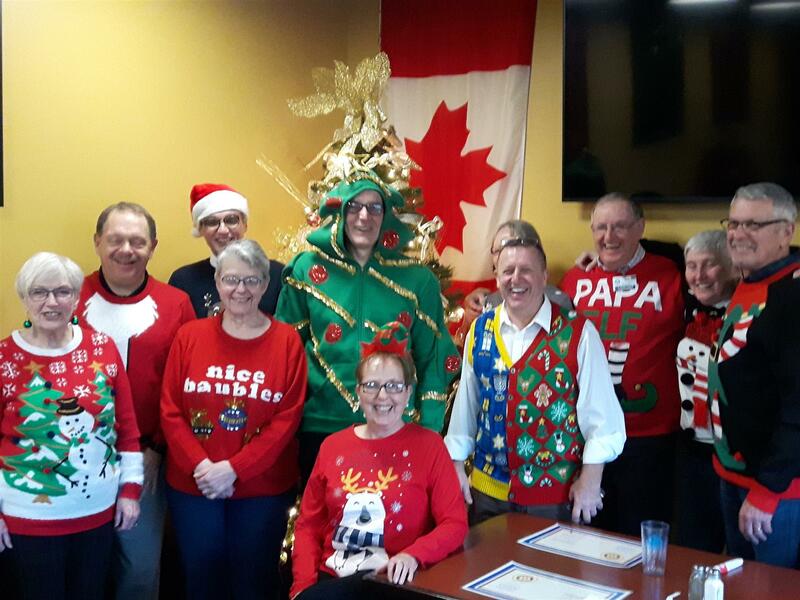 Lorne the Human Christmas Tree Dec 20th 2018 Rotarians all dressed up for Christmas Dec.20th 2018. 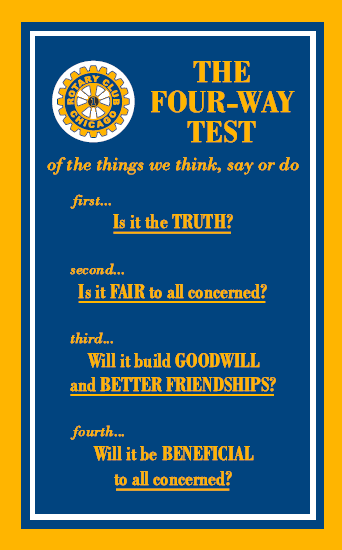 Rotary Supports "Meals On Wheels"
"Play Your Number Lotto" each week! 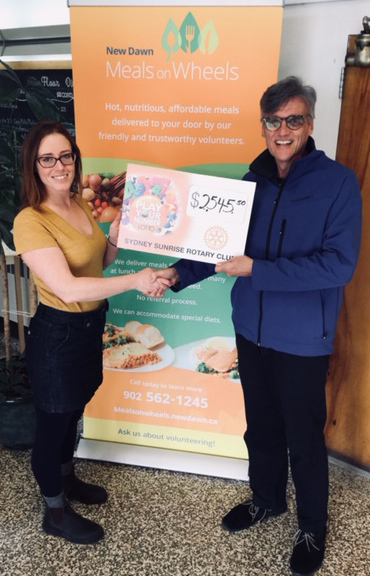 Over the past few months monies from our weekly lotto have gone to two great Charities "Meals On Wheels" programs, Kathleen Whalen from Meals On Wheels in Sydney Cheque presented by Rotarian D.A. Landry. 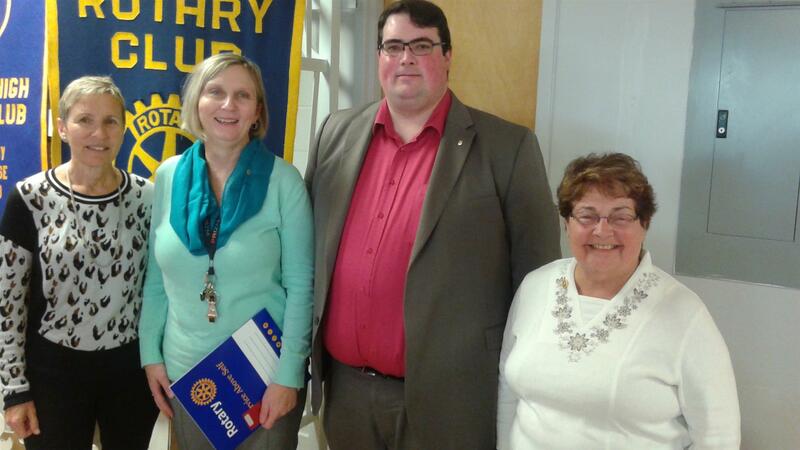 Ed Beaton from The Town House "Meals On Wheels program in Glace Bay with Rotarian Cheryl Card! If you don't have a number yet, pick one up at any Pharmasave or Needs location in Sydney and Glace Bay also at Mullins and Albert Bridge Esso, get details search "Play Your Number Lotto" on Facebook! 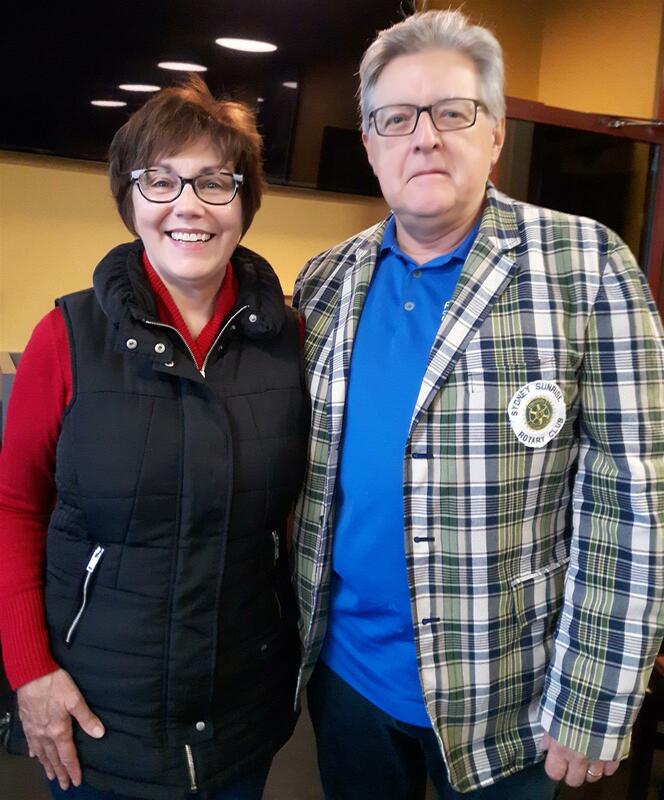 It takes a BIG guy to wear this jacket, and Michael Muise fits the bill, Winner of the "FRIG" Golf Day Championship Oct.4th at Alderdale Greens. It's all in good fun!! 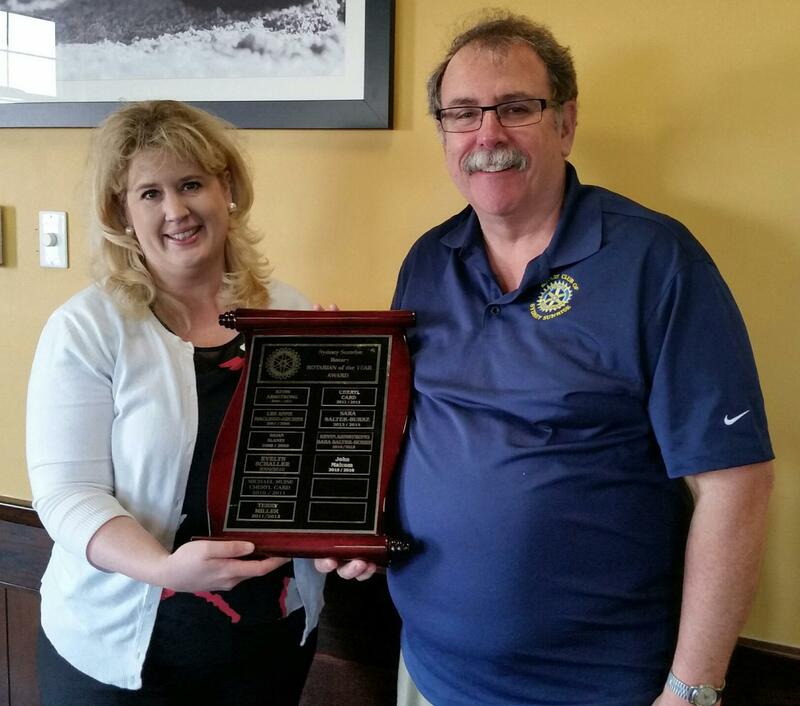 The True Rotarian Award Posthumously to Brian Beckett. Accepting the award daughter Sally and Son Andrew. 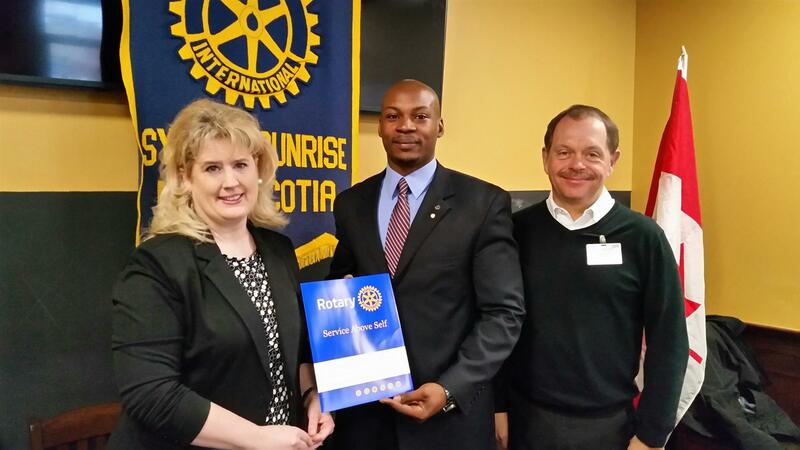 Sydney Sunrise Rotary welcomes our newest member Chigozie Okolie, a Research Assistant at Cape Breton University. 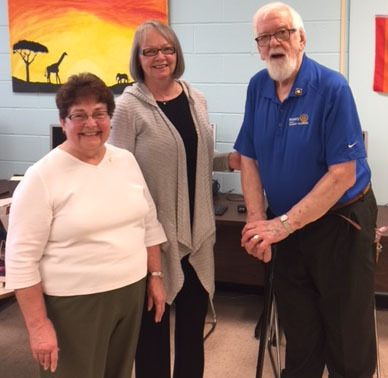 Rotary Club of Cambridge Preston- Hespeler And her husband Guy visited our club this morning while on vacation in Cape Breton. 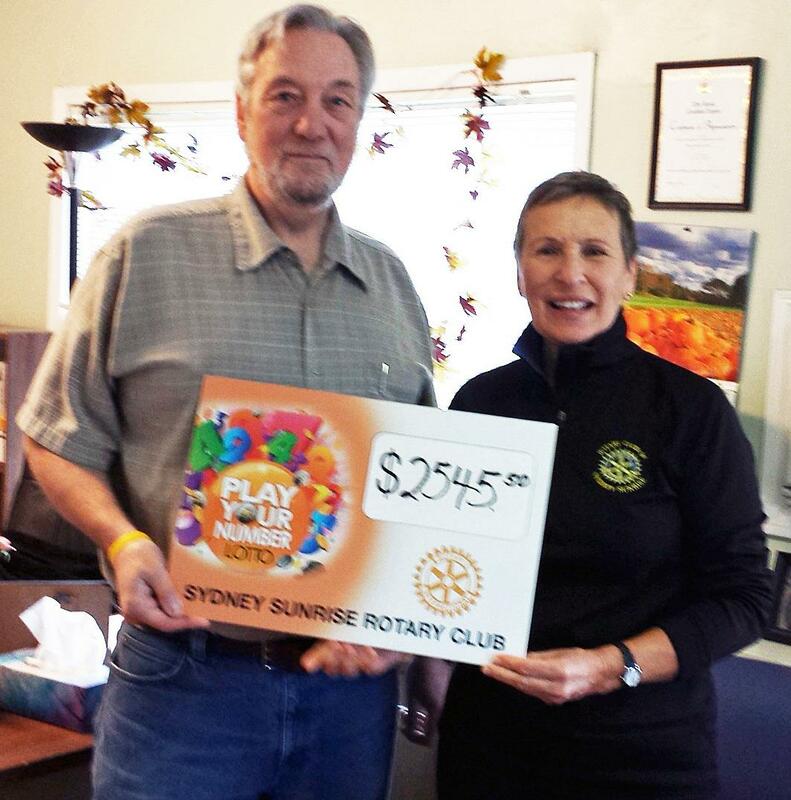 Proceeds from Sydney Sunrise Rotary "Play Your Number Lotto"
Rotary at work in our community! 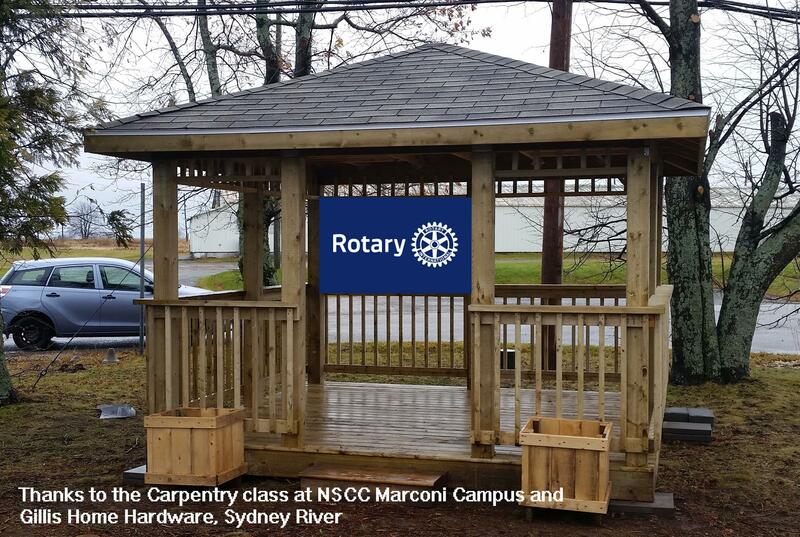 The Rotary Clubs of the CBRM have partnered with the Province of NS, Football Cape Breton and NS Lands to construct a fieldhouse at Open Hearth Park in Sydney to be named in memory of former CBRM mayor, and long-time Rotarian, David Muise. 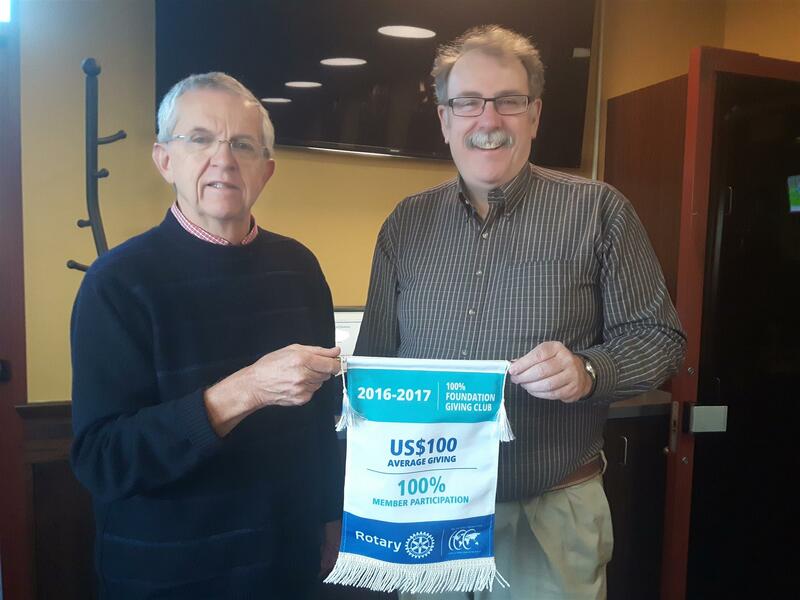 Rotary Club of Sydney-Sunrise president John Malcom (left) and the Honourable Derek Mombourquette are pictured Friday June 29th/2018. 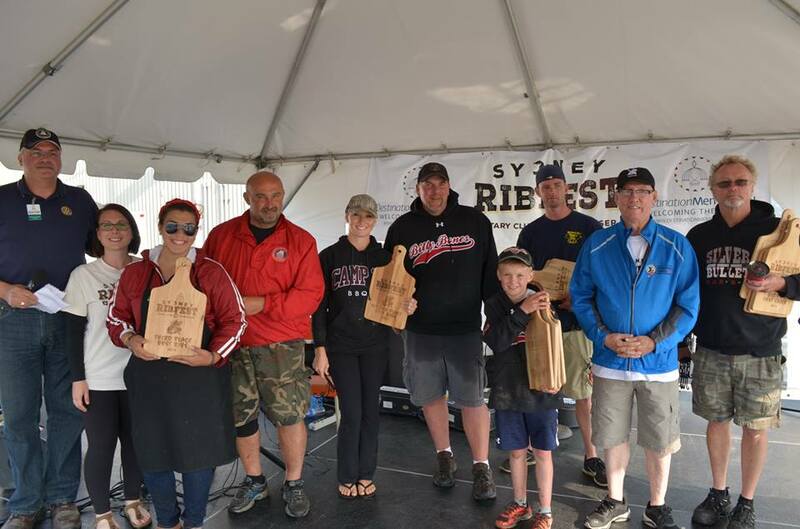 Rotary Sydney Ribfest Award 2018! Philanthropic Organization of Event of the year 2018! 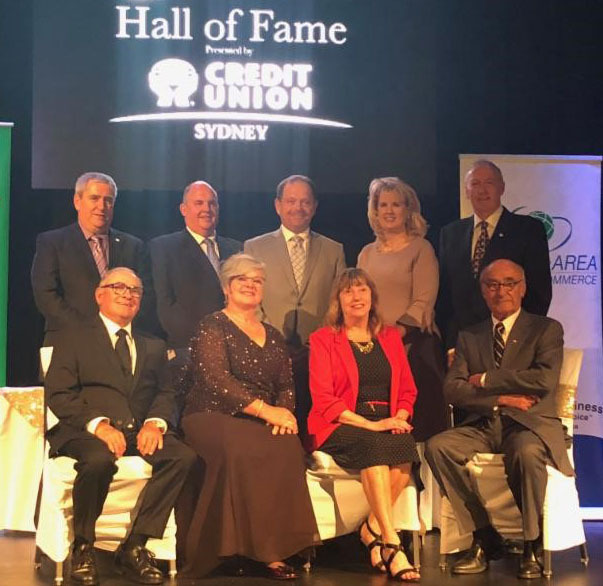 The Cape Breton Business Hall of Fame recognizes the accomplishments and contributions of our outstanding Cape Breton business leaders, to perpetuate and inspire the values of entrepreneurial spirit, personal integrity and community leadership. Philanthropic Organization of Event of the year! 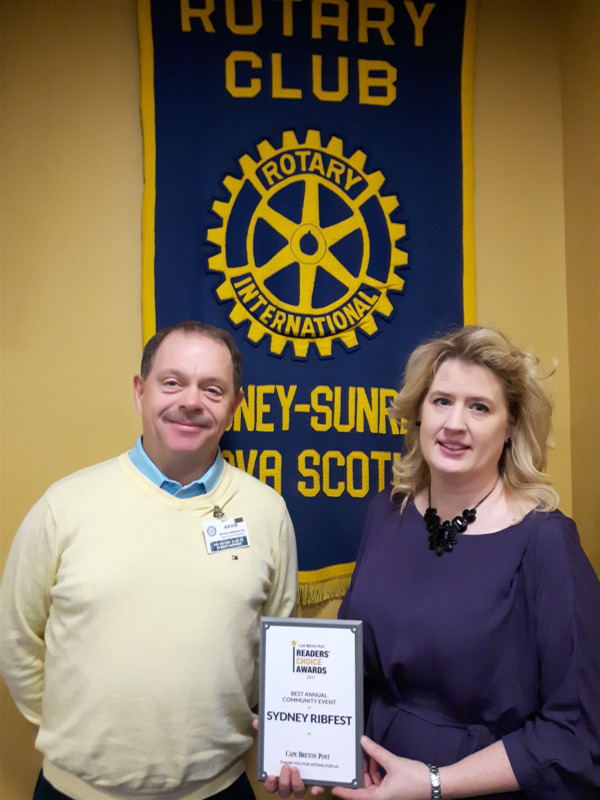 CONGRATULATIONS TO THE ROTARY CLUBS OF CAPE BRETON....WINNER OF THE CAPE BRETON POST READERS' CHOICE AWARD 2017 FOR THE BEST ANNUAL COMMUNITY EVENT "SYDNEY RIBFEST"
your community and across the globe. This is Why you should play every week...chance to win the jackpot..support local charities! 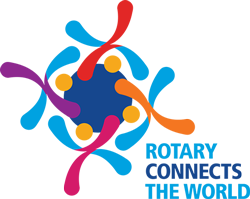 Play Your Number supports local Charities...when you Play each week - local Charities Win Too! 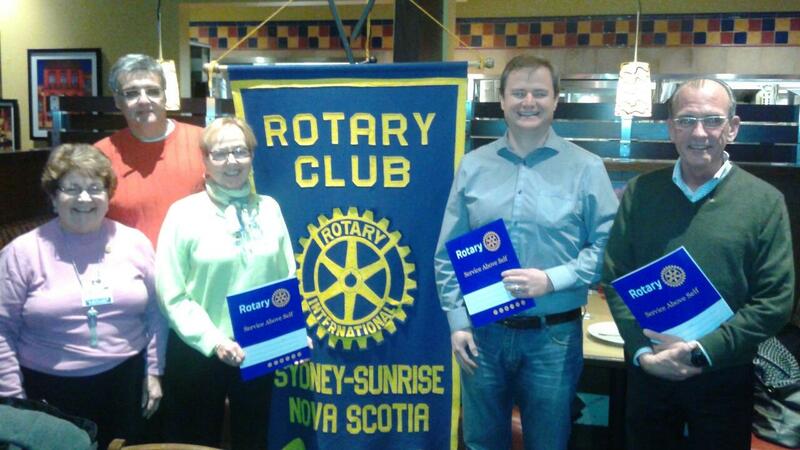 Sydney Sunrise Rotary & N.S.C.C. Gazebo Project for New Dawn Guest Home - Community Working together!! Marg Kingsbury Welcome to the club! 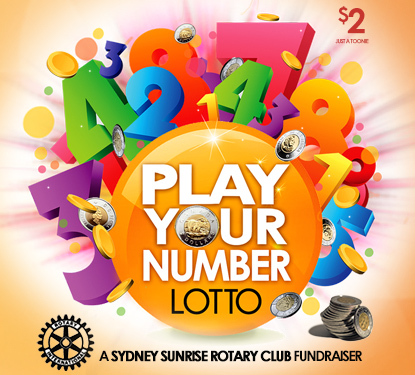 The Sydney Sunrise "Play Your Number Lotto" is pleased to announce that The Every Woman's Center received $2304.50. Thank you to each and everyone who support our weekly Lotto game, keep playing your number. Photo: Club President D. A. Landry with Louise Smith - MacDonald from the Every Woman's Centre! 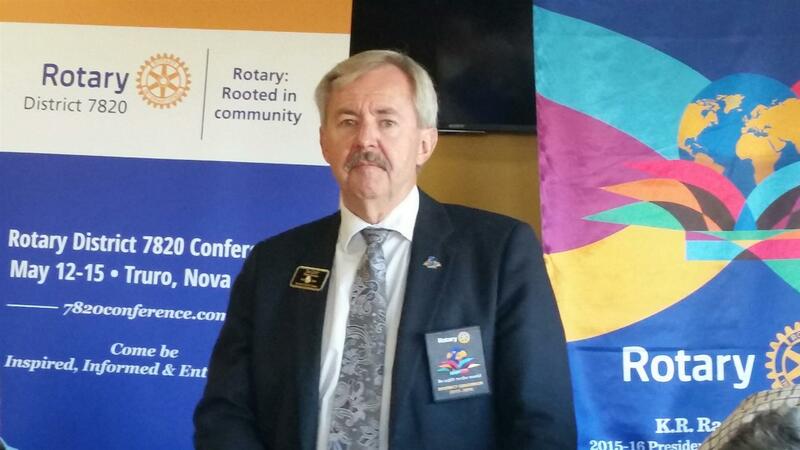 President of the Sydney Sunrise Rotary Club D.A. 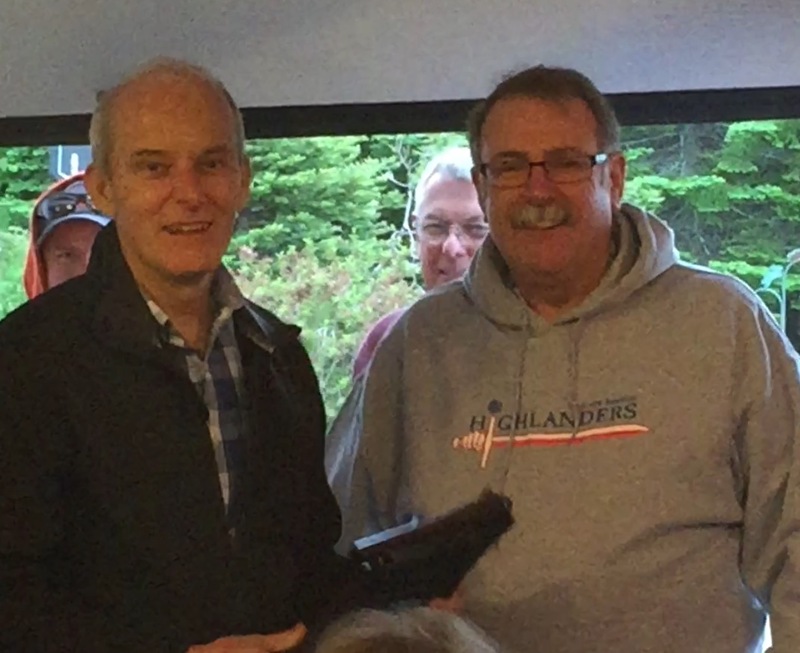 Landry presents Paul Harris Award to Senator Dan Christmas at the Clubs annual charter night May 23,2017. 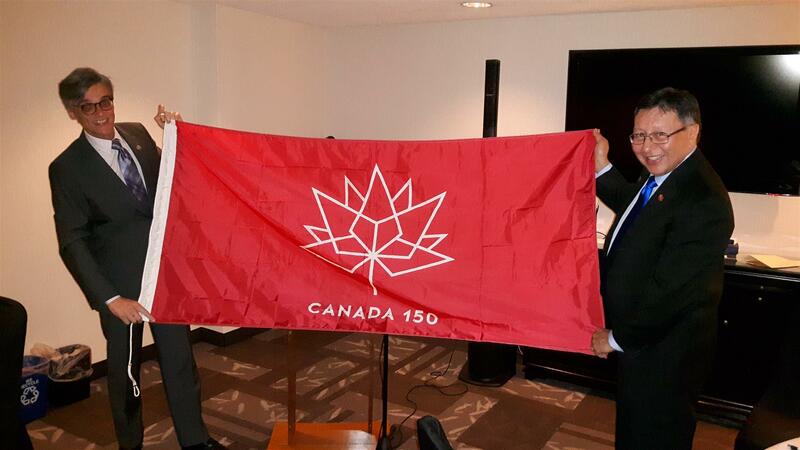 In honor of his visit to our club Senator Dan Christmas presents the New "Canada 150" flag to club President D.A. Landry May 23, 2017. 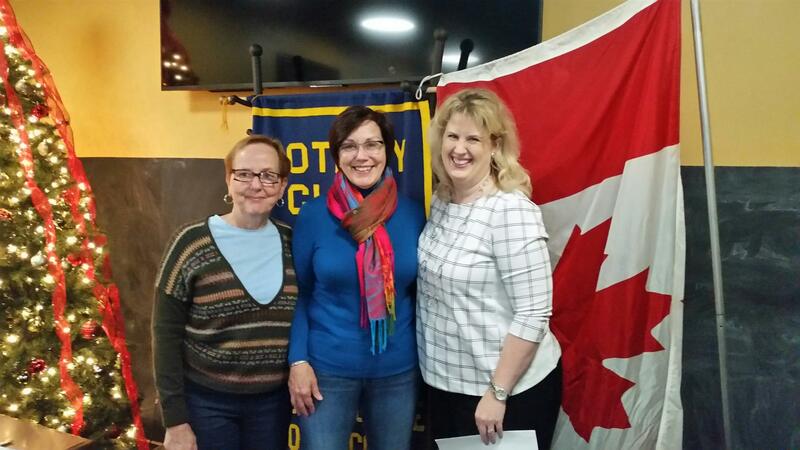 Sydney Sunrise Rotary welcomes Michele McKinnon our newest member to the world of Rotary. Michele is from Sydney and has come home from Halifax to retire , pictured with Michele is Club President D.A. Landry and Michele's sponsor Mike Muise. 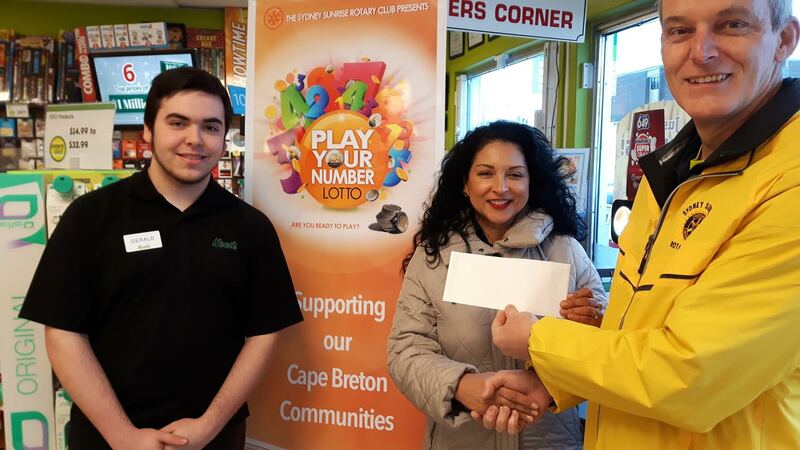 Congratulations to Maria Vajjeo-Quintana from Sydney River Wins $500.00, first winner of Cape Breton's New Lotto game, The Sydney Sunrise Rotary "Play Your Number Lotto"! 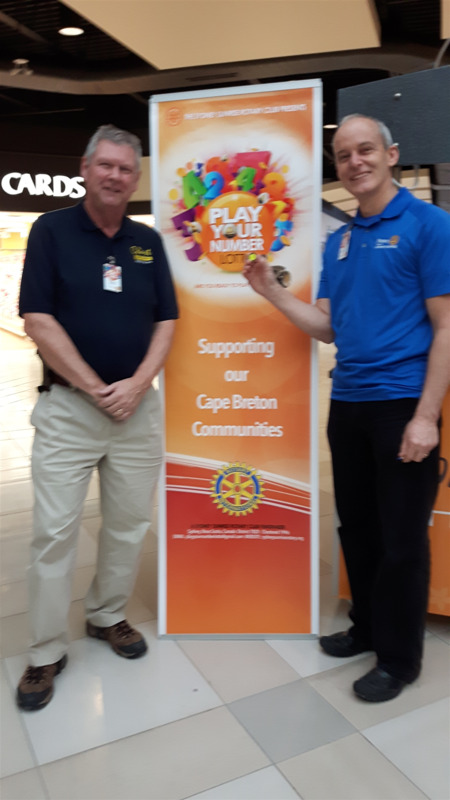 Play the Game that makes you a winner, helping our Cape Breton Communities! Get a number now at any Needs or Pharmasave in The Greater Sydney and Glace Bay Area or at Mullins or XTR in Albert Bridge!! Cape Breton's Newest Lotto Game is Here! 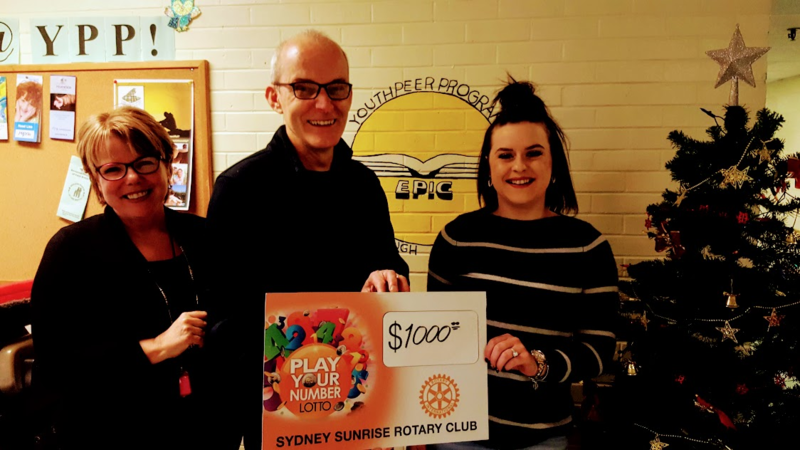 Sydney Sunrise Rotary has launched a new way to Win Cash, It's "Play Your Number Lotto", a great way to Win cash and help our local charities, starting with "The Every Woman's Center". Register your number and play a Toonie each week. numbers are now available at Pharmasave and Need Stores in the greater Sydney and Glace Bay area, along with Mullins and XTR Gas in Albert Bridge. First Big Draw is Valentine's Day Feb.14th for $500.00, with a new cash jackpot each week, Draws will be every Tuesday! 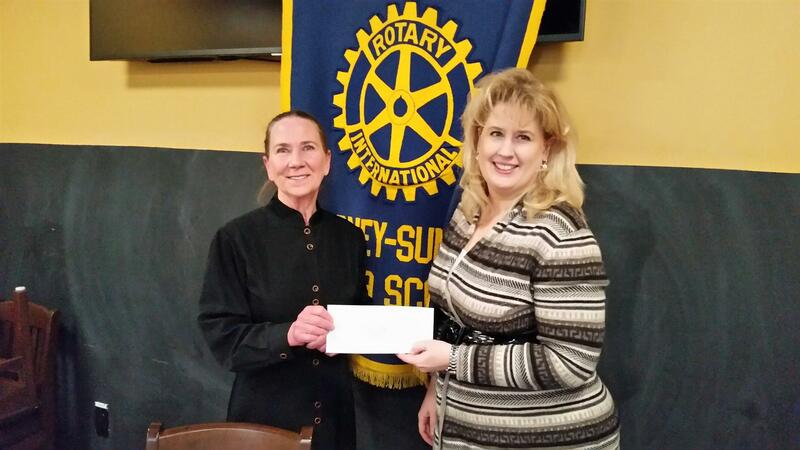 Donations from local area Rotary clubs along with personal donations from Rotarians resulted in a significant monetary contribution towards the relief of the victims of the Thanksgiving Day flood. 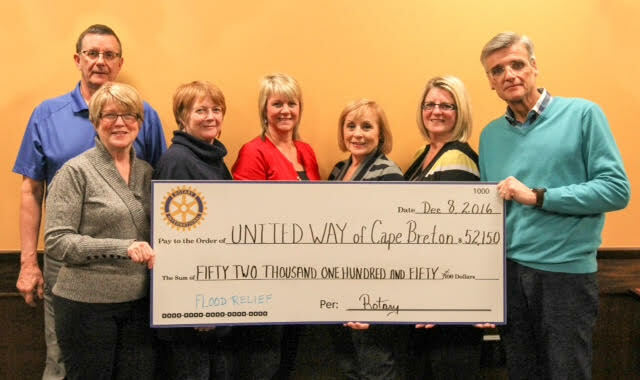 At the recent Floodsgiving Benefit Concert at Centre 200, a cheque in the amount of $52,150 was presented to the United Way of Cape Breton flood relief fund. Rotary's commitment to community service was a dominant factor in responding to this local disaster. 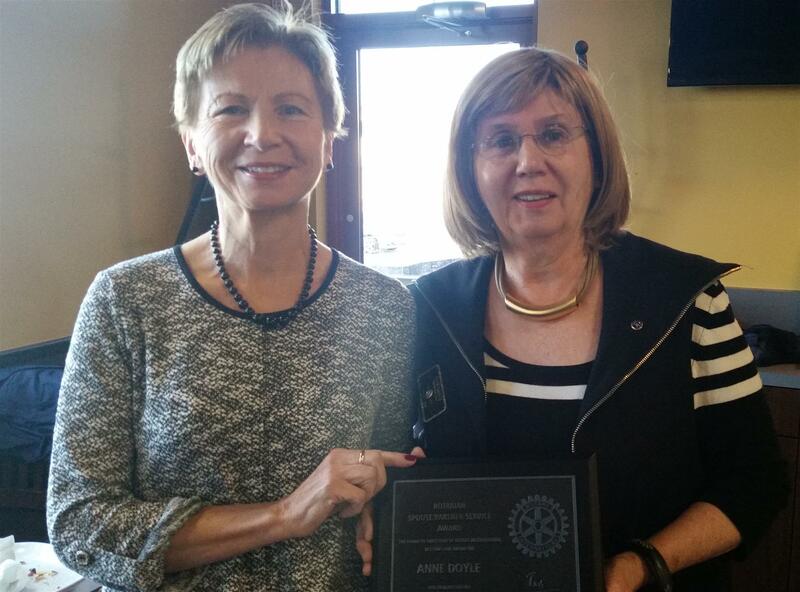 Sydney Sunrise Rotary congratulates Ann Doyle, of Coxheath, Ann receives a Special honor for her volunteer work with the club in the community and around the world, a true leader, only 100 people in the world receive this honor from Rotary International. 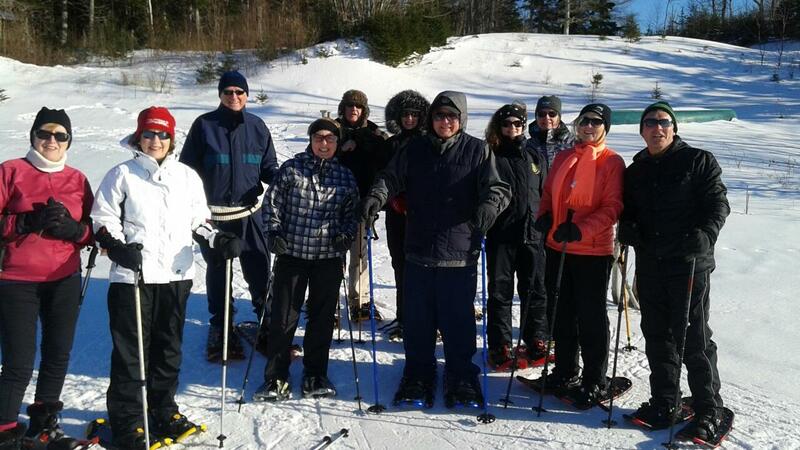 Sydney Sunrise Rotary recently hosted the New Zealand Friendship Exchange group, dropping by our club for a few days of touring and socials in Cape Breton. 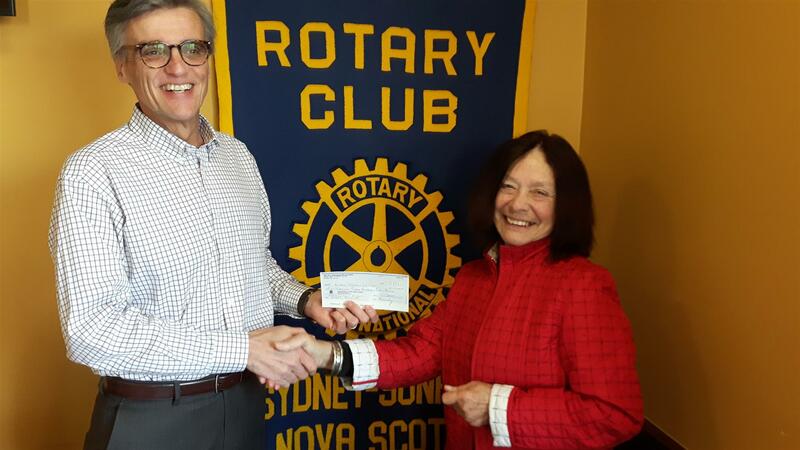 Sydney, N.S…..As Open Hearth Park returns to soccer play and open green spaces, the Rotary Clubs of CBRM have packed up all the trappings of Ribfest 2016 and are pleased to announce a second significant donation to the Hospice Palliative Care Society of Cape Breton. 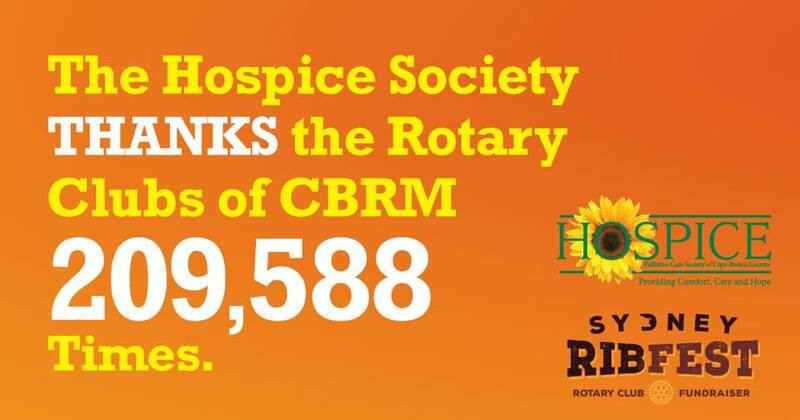 Thanks to the exceptional efforts by the Rotary Clubs of CBRM’s Sydney Ribfest 2016, the Hospice Palliative Care Society of Cape Breton will be the recipient of $70,000 donated by generous Cape Bretoners who “Gave a Little at the Gate” combined with the generous support of the four CBRM Rotary Clubs. 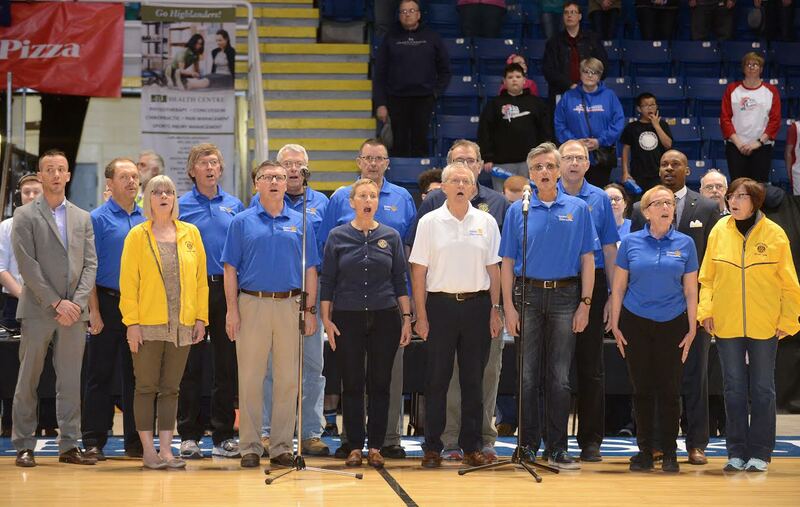 Gate proceeds amounted to almost $47,000 and the balance of $23,000 has been contributed by the Rotary Clubs, in addition to planning, staging and running Ribfest. 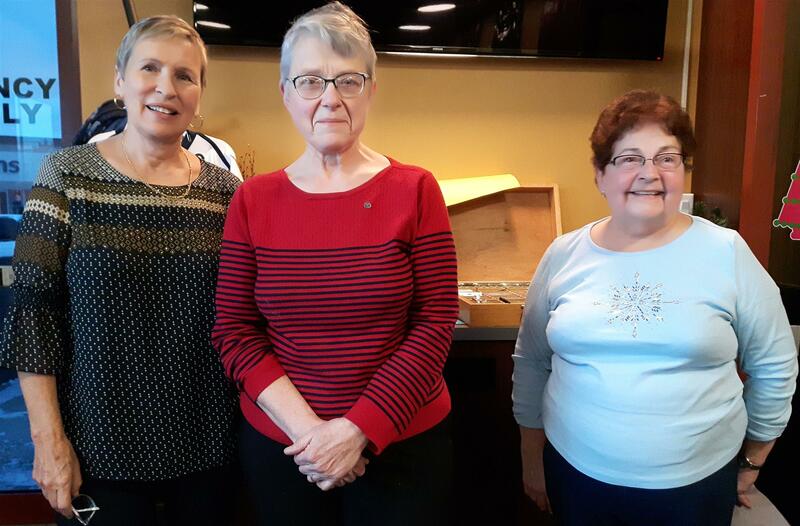 This amount exceeds the total of $55,000 raised in 2015 and once all financial obligations are met for this year, it is the intention of the Clubs to contribute additional monies to the Hospice Residence Project, if available. 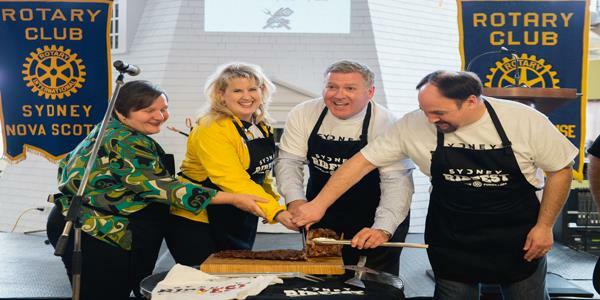 This year Sydney Ribfest 2016 positioned itself with the theme of “more” – more food, more entertainment, more children’s activities, more parking and now can add “more money raised” for Hospice Palliative Care patients and families. Thank you to the sponsors and volunteers who supported our Sydney Ribfest 2016!! 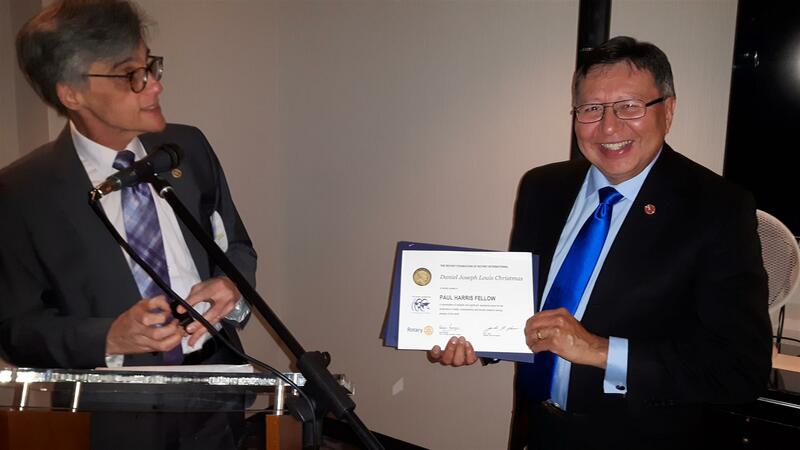 Sydney Sunrise Rotary Announces "Rotarian Of The Year"
It's with great pleasure that the Sydney Sunrise Rotary Club announces our "Rotarian Of The Year" award this year to John Malcolm. 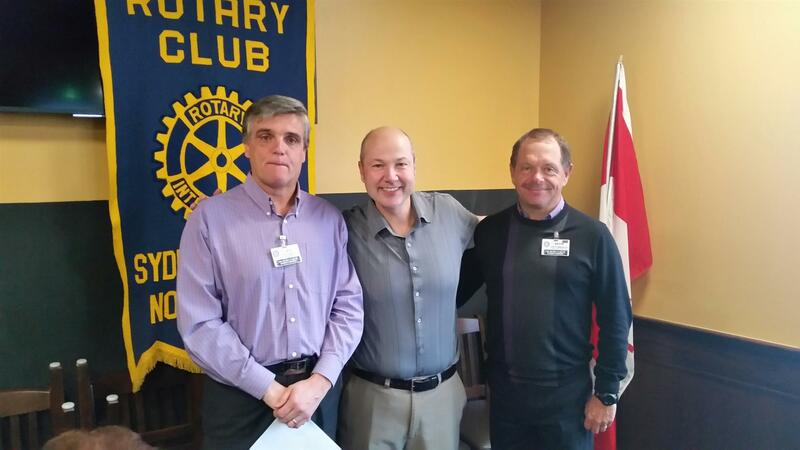 John has proven "Service Above Self" the Rotarian motto, involved in many areas on the club, Ribfest Sponsor chair and serving on community Service projects. Well Done John Malcolm, thank you for your service to our community!! 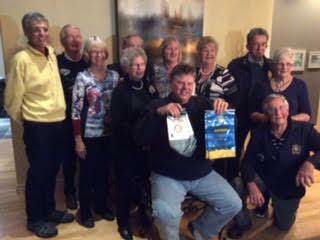 and Rotary Clubs in the C.B.R.M. at Open Hearth Park, Sydney! Mayor Cecil Clarke of C.B.R.M. 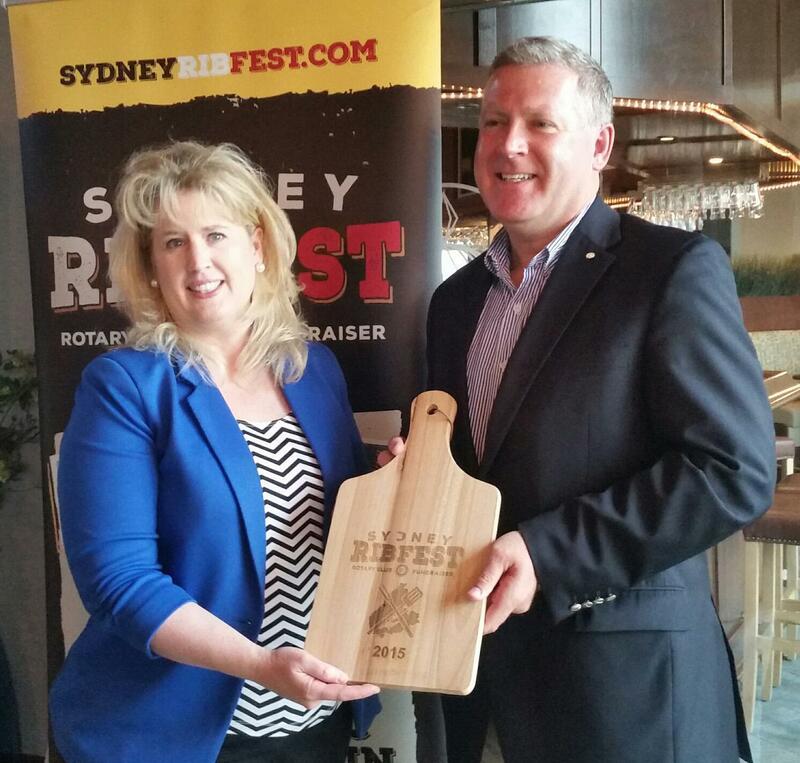 sponsor again of Sydney Ribfest! 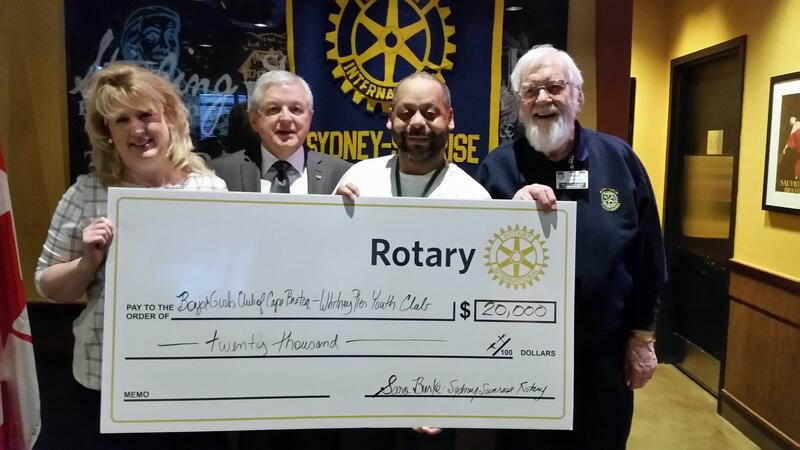 Sydney Sunrise Rotary present a $500. Donation to the Salvation Army! 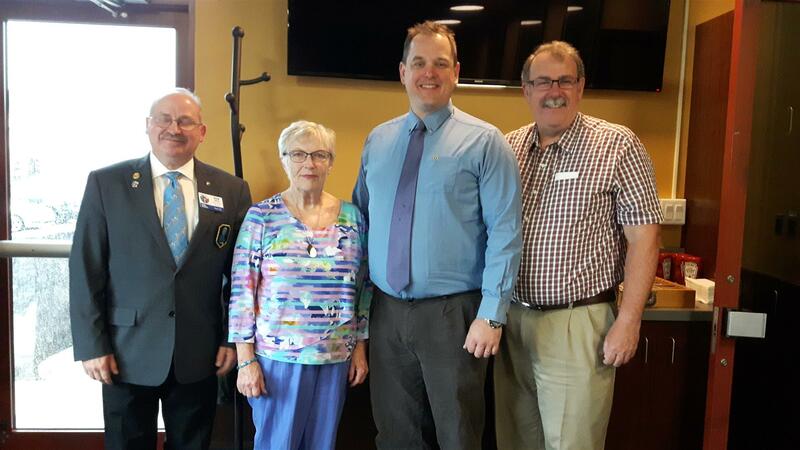 Major Kent Hepditch attended our Rotary meeting on Thursday May 26th, 2016 pictured with Rotarian Bill Vokey the presentation of $500. 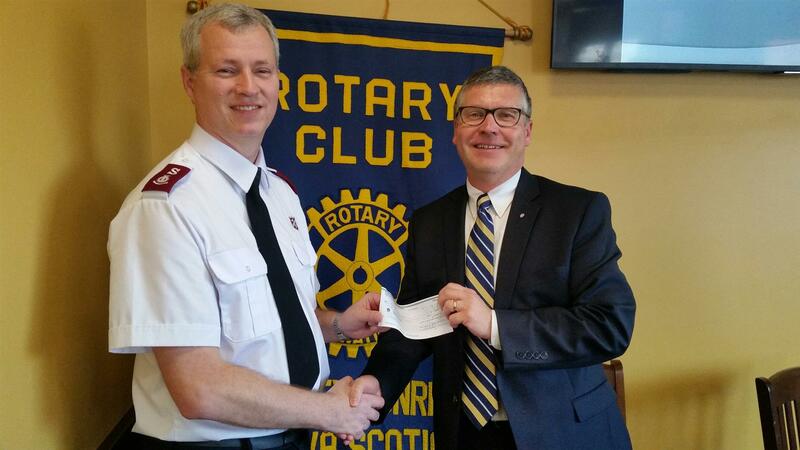 to the Salvation Army to continue their great community work. 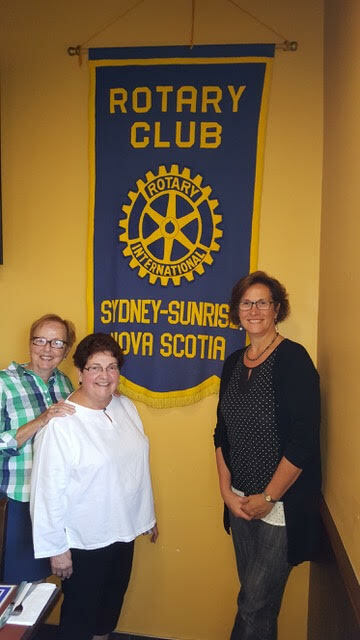 Sydney Sunrise Rotary happy to donate $10,000.00 to help out with a new Dishwasher and other upgrades to the building on Charlotte St. Sydney. 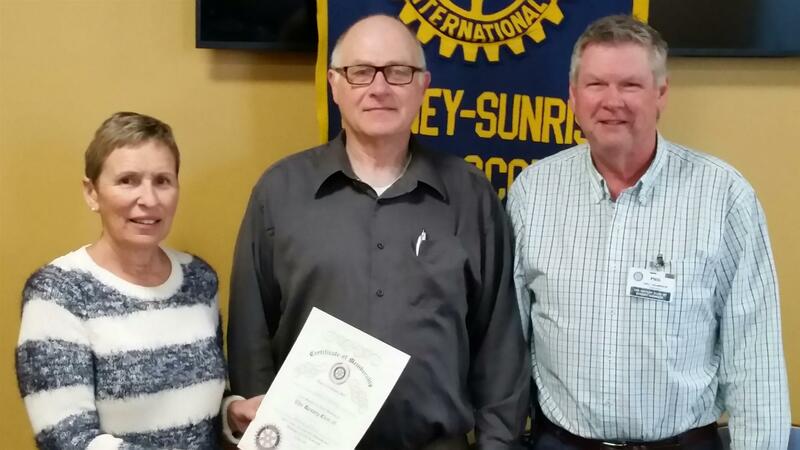 The Sydney Sunrise Rotary Club welcomes our newest member Mr. Jack D'Orsay from Coxheath. 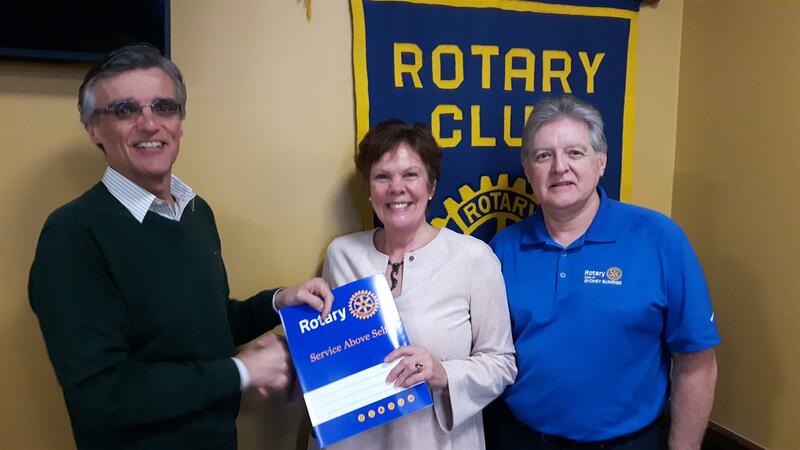 President Sara Burke welcomes our newest Rotarian Mr. Tyrone Levingston, President of the Cape Breton Highlanders Basketball team, next to Tyrone is his Rotarian sponsor Kevin Armstrong. 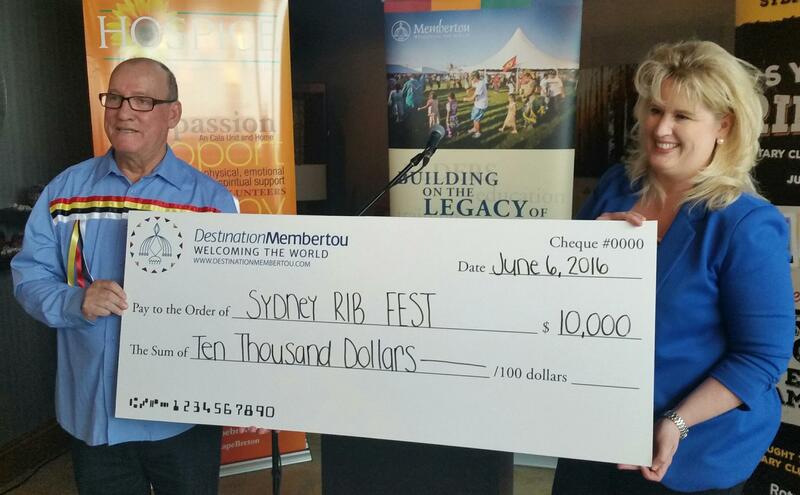 MEMBERTOU FIRST NATION BAND COUNCIL RECEIVE RECOGNITION FOR PRIME RIBBER SPONSORSHIP 2015 SYDNEY RIBFEST! A big thank you to Membertou First Nation Band Council for stepping up to be our "Prime Ribber" sponsor at Sydney Ribfest 2015! Club President Sara Burke and Kevin Armstrong visit Membertou Band Council with Presenation! 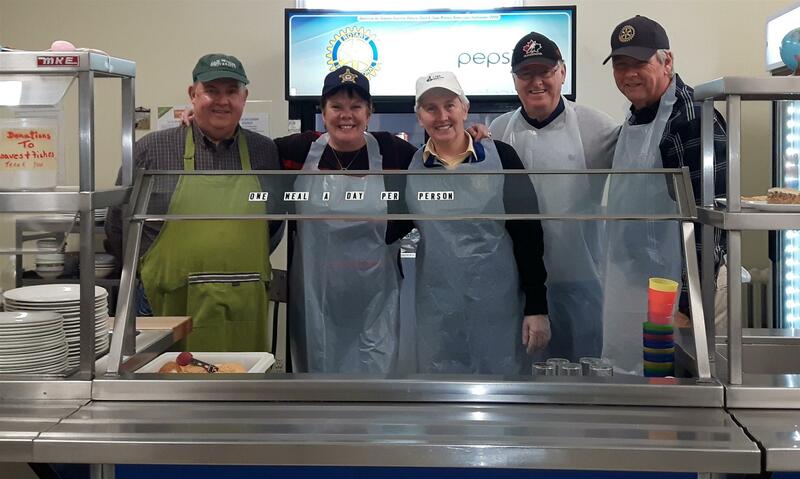 Sydney Sunrise Rotary on going support of Sydney's largest food bank "Loaves and Fishes". Our club purchases food supplies and serves the meal six times each year! 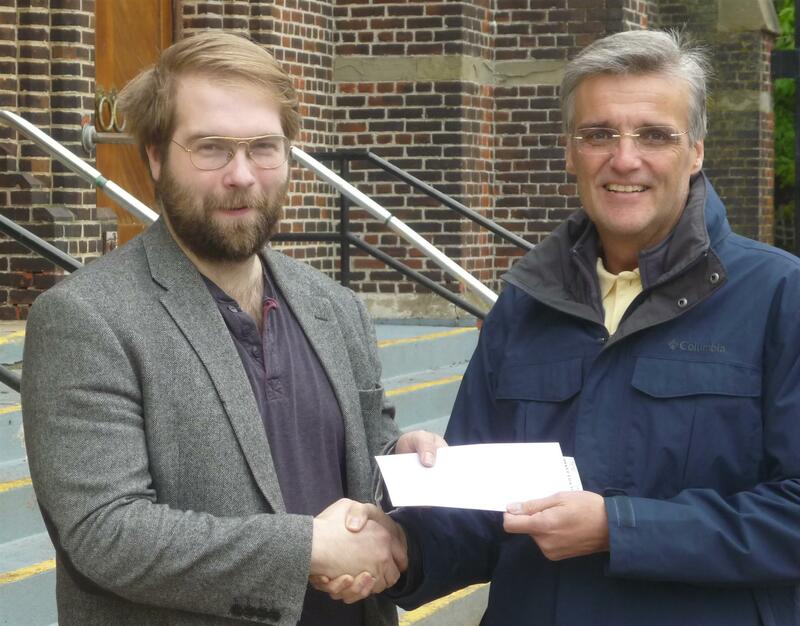 Indeed, Marco Amati, Manager of the Inner City Churches Loaves and Fishes Society, recently acknowledged an increase this year in the number of people coming into the kitchen for a meal. 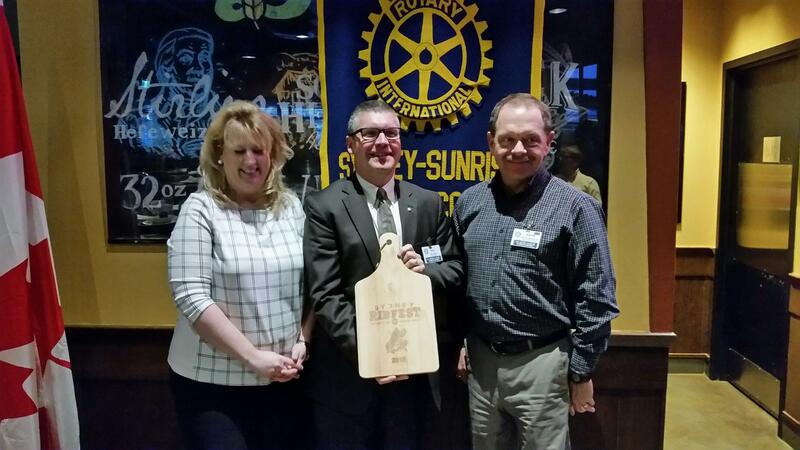 Sydney Sunrise Rotary Supports Whitney Pier Boys and Girls New Club Renovation! 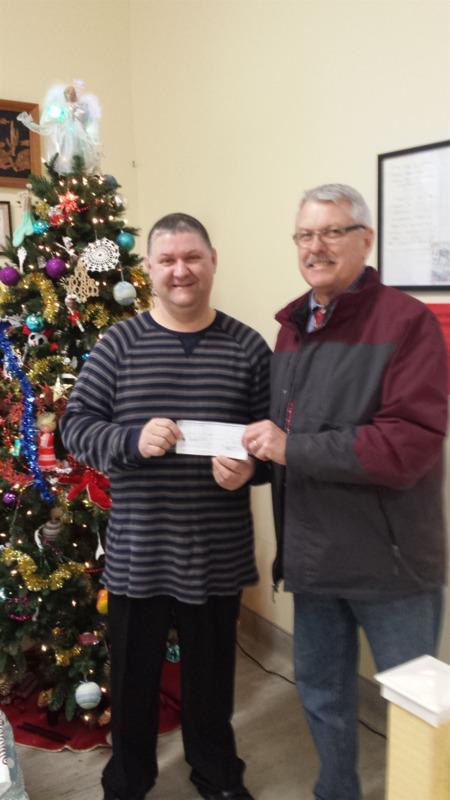 Sydney Sunrise Rotary presents a cheque of $20,000.00 to Chester Borden of the Whitney Pier Boys and Girls Club to help with new expansion of the Club House in Whitney Pier. 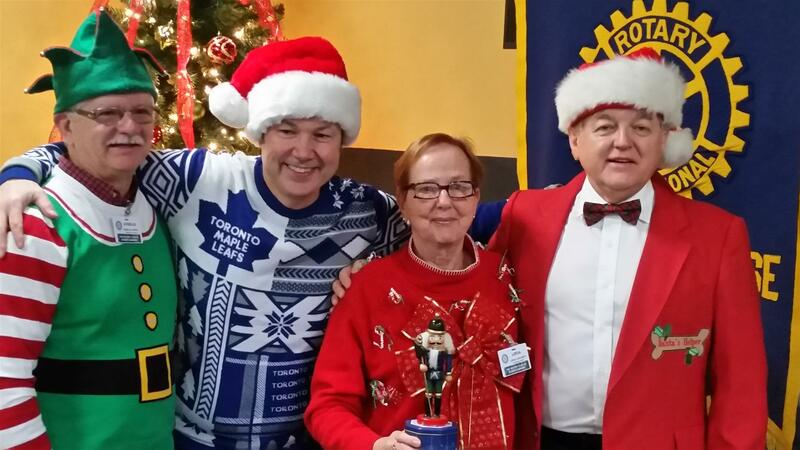 Pictured L to R....Sydney Sunrise Rotary President Sara Burke; Rotarian Dave Muise; Chester Borden (Boys and Girls club Director and Brian Beckett Rotary Community Service Chair! 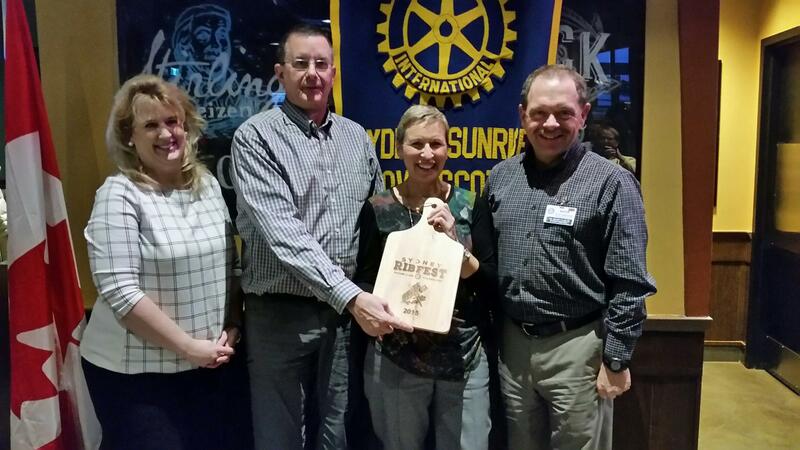 Sydney Sunrise Rotary Ready to kick off the 2016 edition of Sydney Ribfest July 15th; 16th & 17th at The Open Hearth Park in Sydney! 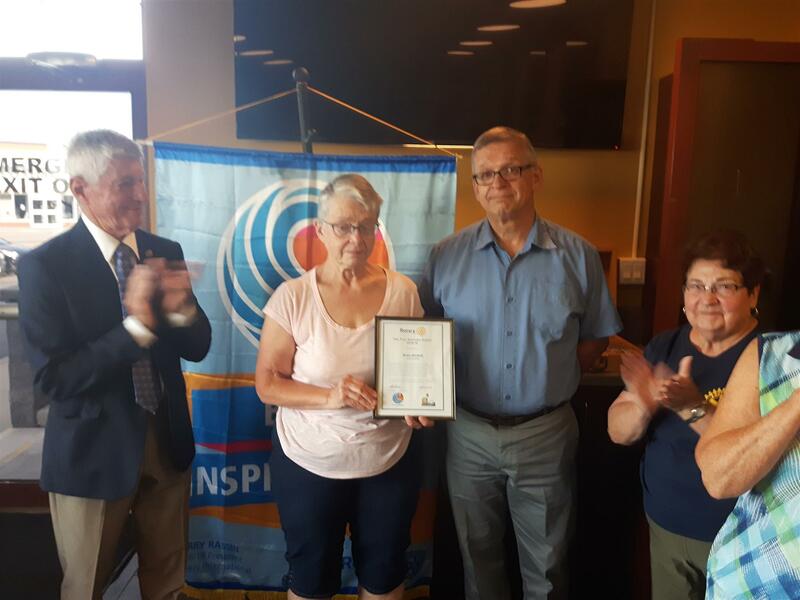 Photo( Lto R) Club President Sara Burke; Gord and Cheryl Card owner/operator of Boston Pizza Sydney and Kevin Armstrong Co-chair. 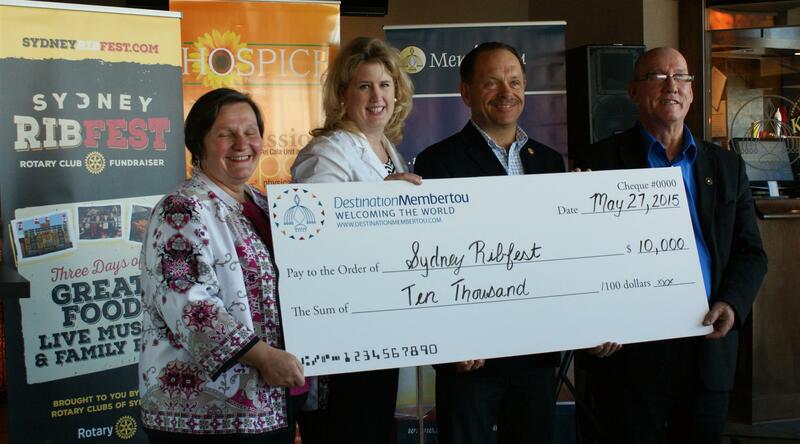 Thanks to TD Bank for stepping up to support Cape Breton's Best New event "Sydney Ribfest" supporting Hospice Cape Breton! 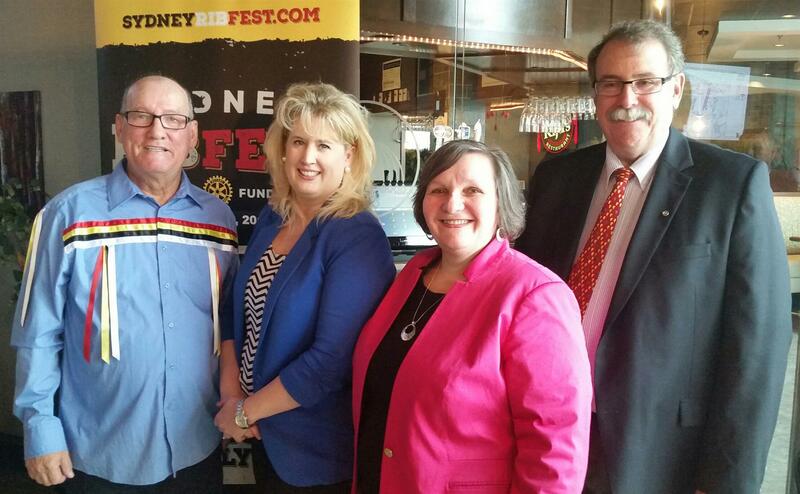 Club President Sara Burke with TD Branch Manager Bill Vokey and Co-chair of Sydney Ribfest Kevin Armstrong! Hosted at the Best Western Plus Glengarry Hotel. Every contest must have Winners...Boy do we have WINNERS!! 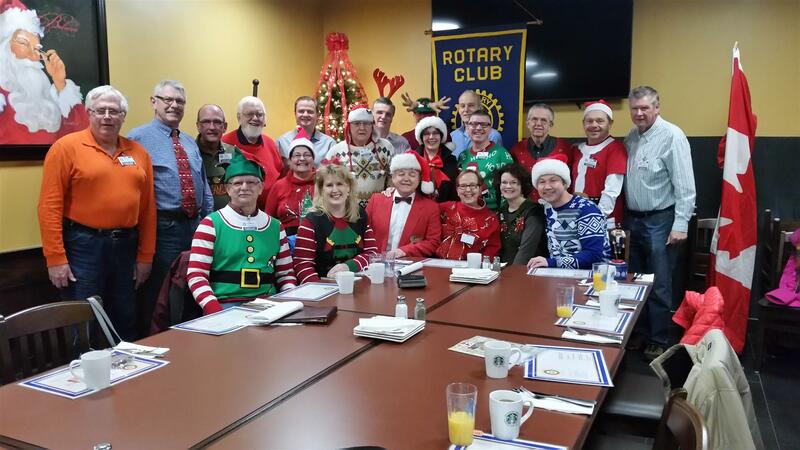 Sydney Sunrise Rotary members celebrate Ugly Sweater Day Christmas Eve 2015!! A fun day for a great cause. 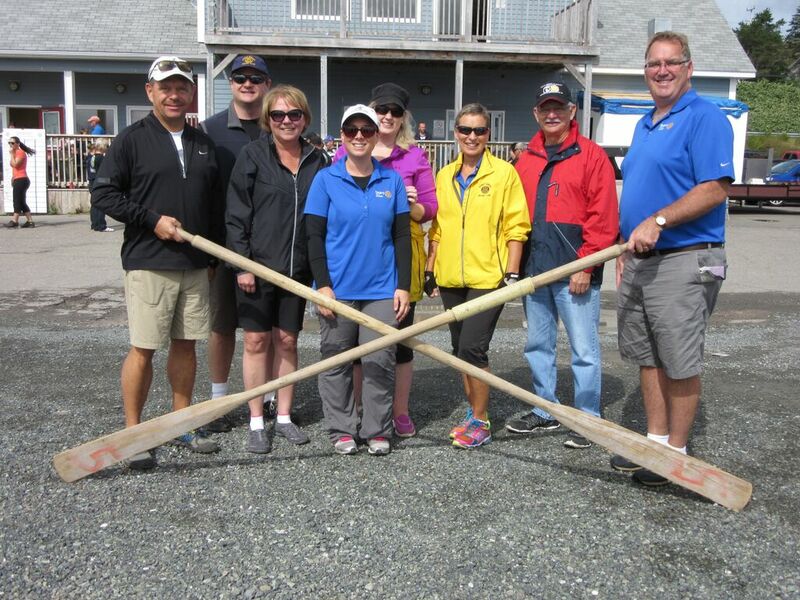 Our team members from the Rotary Whaler Boat Races, Sunday September 13th at Northern Yahct club, North Sydney! 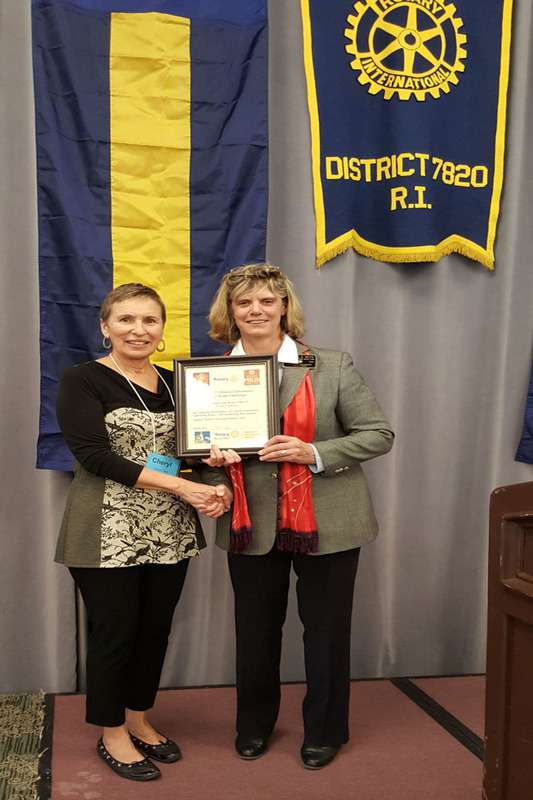 SYDNEY SUNRISE ROTARY PRESIDENT CHERYL CARD ACCEPTS THE PRESIDENTIAL CITATION AND DG'S GREAT WORK CHALLENGE AWARD FOR THE SYDNEY SUNRISE ROTARY CLUB FROM 7820 DISTRICT GOVERNOR STELLAR ROY AT ROTARY CONVENTION IN HALIFAX, MAY 2015! Rotaract Sign Up at C.B.U. 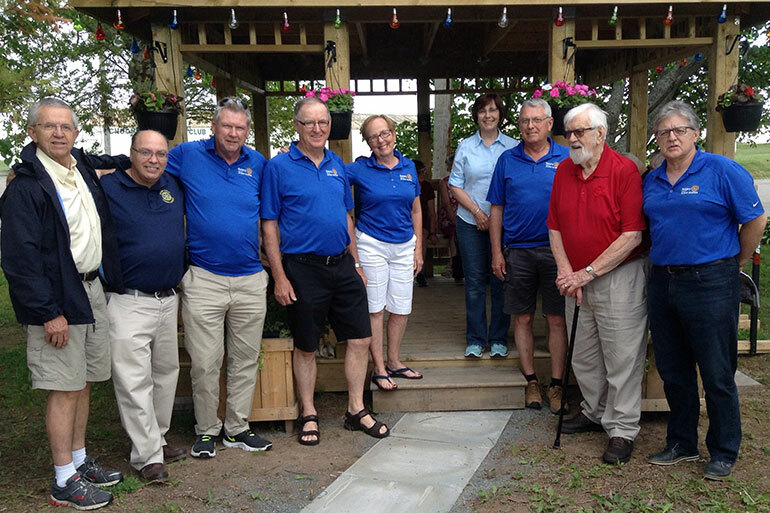 SYDNEY-SUNRISE ROTARY MEMBERS RAYMACNEIL; CHARLIE CUFF; AURELLE LANDRY AND BRIAN BECKETT (KEVIN ARMSTRONG TAKING PHOTO) FUNDED AND PREPARE BBQ FOR LOAVES AND FISHES ON JULY 19TH 2014! 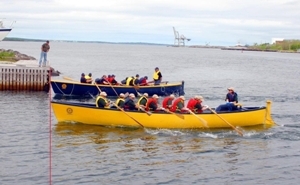 On Saturday, June 15th, the Sydney-Sunrise Rotary hosted the annual Whaler Boat Races at the Dobson Yacht Club in Westmount.